joining a catalog that includes Widespread Panic, Colonel Bruce Hampton, and other Southern artists. 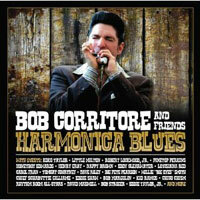 HARMONICA BLUES celebrates forty years since Bob Corritore first picked up a harp. He maximized his early proximity to the 1970s Chicago Blues scene, befriending and learning from masters Louis Myers, Eddie Taylor, Robert Lockwood, Jr., Little Willie Anderson, Big Leon Brooks, Lester Davenport, Big Smokey Smothers, Little Mack Simmons, and others. Since relocating to Phoenix, Arizona in 1981, Bob has been prolific as a player, producer, radio personality since ‘84, and owner of the renowned Rhythm Room with which he’s been associated for nineteen years now. 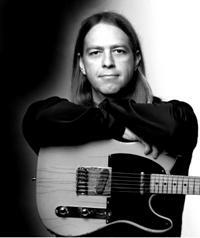 In 1999 his debut CD ALL-STAR BLUES SESSIONS was issued, an impressive selection of his productions and his own playing. Two years later the anthology RHYTHM ROOM BLUES confirmed his taste and the quality of his associates. 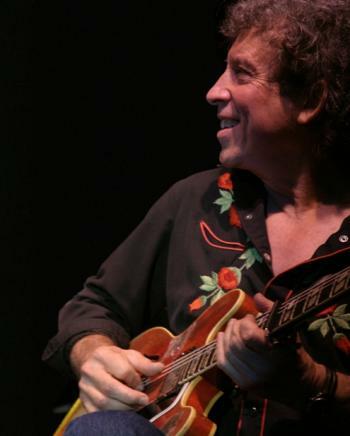 Since the release of ALL-STAR BLUES SESSIONS, Bob has built on that illustrious foundation, contributing his authoritative harp to about forty releases. 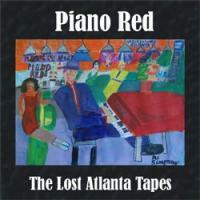 Now the hard work, dedication, love and talent through which Bob has built a remarkable life and career in the Blues are brought to bear on HARMONICA BLUES, fifteen diverse but uniformly rewarding tracks featuring his harp and production, and a virtual Who’s Who of traditional Blues recorded between 1989 and 2009. A listen, or just a glance at the credits, makes it clear how well Bob is able to recruit stellar Blues players, then combine and accompany them in ways that bring the best out of the featured artist. 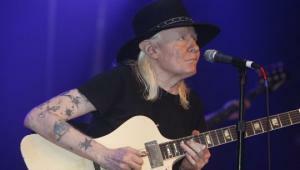 Lockwood’s emphatic and only recording of “That’s All Right,” the Blues classic which he reputedly wrote, is a historic and musical highlight. Koko Taylor, Eddie Shaw, Eddy Clearwater, Henry Gray, Pinetop Perkins, Honeyboy Edwards and Little Milton are other leaders with deep Chicago roots, while Eddie Taylor Jr., Bob Stroger, Willie “Big Eyes” Smith, Chico Chism, Chris James, Patrick Rynn, Bob Riedy and Jon Hiller contribute as sidemen. But HARMONICA BLUES encompasses far more than Bob’s Chicago background, thanks to the likes of Louisiana Red, Dave Riley, Nappy Brown, Big Pete Pearson, Tomcat Courtney, Chief Schiabutte Gilliame and Carol Fran, and accompanists including Bob Margolin, Kid Ramos, Buddy Reed, David Maxwell and others including some Rhythm Room stalwarts. Thank you Bob & AJ. I'm very proud of "Keepin On"
The Blues Foundation, the international organization dedicated to the past, present and future of blues music, has completed its election of its Board of Directors and officers, selecting ten individuals to join the 25-person Board. 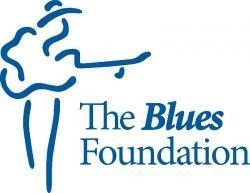 Board members help to develop the vision for The Blues Foundation and acquire the resources to implement those plans. These new members join the board as The Blues Foundation investigates the possibility of a permanent home in downtown Memphis, to centralize the Foundation's educational, audio-visual and retail activities, in addition to housing staff and operations. The new board members will contribute their respective expertise in finance, marketing, consulting and development to the Foundation's efforts through 2012. Five new members join the Board: Kathy Bolmer, KB Behavioral Healthcare, Franklin, TN; Ron Partain, Consulting Services Group, Germantown, TN; Hugh Southard, Blue Mountain Artists; Charlotte, NC; Eric Steiner, Washington Blues Society; Edmonds, WA; and Bob Trenchard, Jr., Catfood Records, El Paso, TX. Five board members were re-elected; Gary Anton, Jostein Forsberg, Zac Harmon, Jerry "Boogie" Mason and Bill Wax. All recently-elected members will begin three-year terms on September 1, 2010. Following the Board election, the new Board selected the following Board members to leadership positions, who will serve for one year each: President Bill Wax, Program Director of B.B. King's Bluesville on Sirius XM Satellite Radio and Vice President Eric Simonsen, a retired corporate executive and financial officer. Additional members of the Executive Committee include: Memphis Convention and Visitor's Bureau CEO Kevin Kane, Jackson, MS performer Dorothy Moore, and Gary Anton, a Tallahassee, FL attorney and owner of Bradfordville Blues Club, In addition, Clay Purdom, an attorney with the Memphis law firm of Martin, Tate, Morrow & Marston, is the Treasurer. The newly-elected members and officers join fellow Board members Phil Barkett III, Steve Bryson, Thomas Cain, Tom Jones, Kevin Kane, Stefan Levy, Jerry Mason, Dorothy Moore, Gaynell Rogers, Thomas Ruf, Joey Sichting, Ricky Stevens, Cassie Taylor, Laurie Tucker and C. Sade Turnipseed. In speaking about being elected as the new Board President, Bill Wax said "First let me thank the past two Board Presidents, Paul Benjamin and Pat Morgan for leaving the Foundation in such good shape. I hope over the next 12 months we can begin to make real the dream of a permanent home for the Foundation as well as get the word out about our partnership with Sound Healthcare to help more folks in the blues get health coverage." Executive Director Jay Sieleman added "This is a stellar group with directors elected from the blues music community and the business, finance and marketing worlds. They all share a love for blues music and a commitment to aid The Blues Foundation going forward. This past year, the Foundation celebrated the 31st annual Blues Music Awards and the 26th anniversary of the International Blues Challenge. They also announced two new programs to further assist blues musicians and those making their careers within the blues music community. Sound Healthcare offers musicians health insurance access and Generation Blues allows scholarships for youth under the age of 25 to study their instrument of choice at reputable camps, seminars and workshop programs. The following Board members will be concluding their Board service this month Pat Morgan, Betsie Brown, and Karen McFarland. 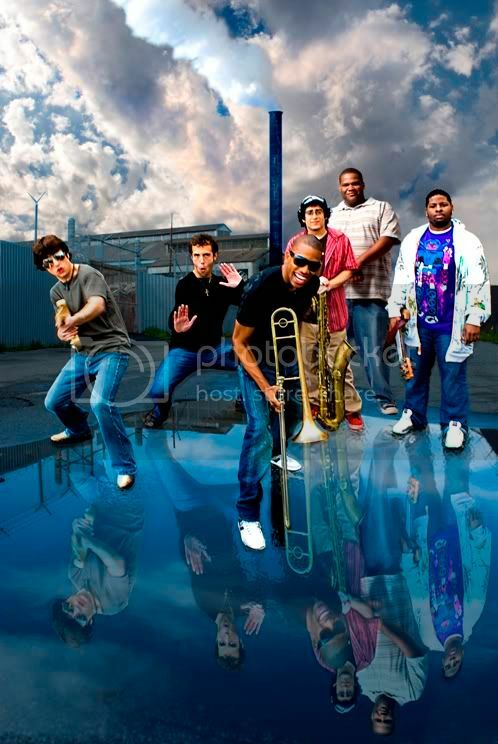 Blues band Champagne and Temporary Saint will play a live concert onboard the Alaska Railroad providing a complementing soundtrack to the scenic Chugach Forest, passing glaciers and wildlife. The special Blues Train is a tour package from the Alaska Railroad and Blues Central that runs from Anchorage to Seward on Sept. 18 and kicks off a blues weekend of dancing and dining. 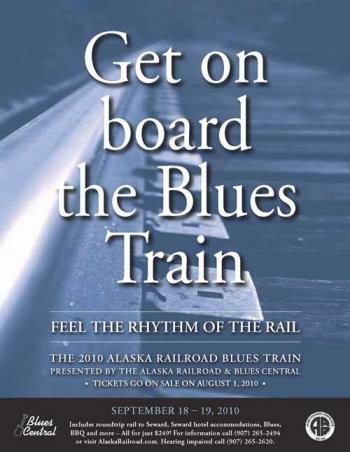 Each year the Alaska Railroad wraps up its summer passenger season by partnering with Blues Central to host a music-inspired weekend onboard the train and continued in Seward. The roundtrip event begins in Anchorage at 1 p.m. delivering guests in style aboard the Alaska Railroad to Seward where the festivities continue at The Pit bar. The train returns to Anchorage on Sunday. "It's just a fun way to unwind after a long summer," said Susie Kiger, Alaska Railroad Director of Passenger Sales and Marketing. "It's one of our most popular specialty trains with riders looking for a weekend getaway. This trip allows them to enjoy the fall colors on the scenic route between Anchorage and Seward. You don't have to be just a blues fanatic to enjoy this festive weekend." 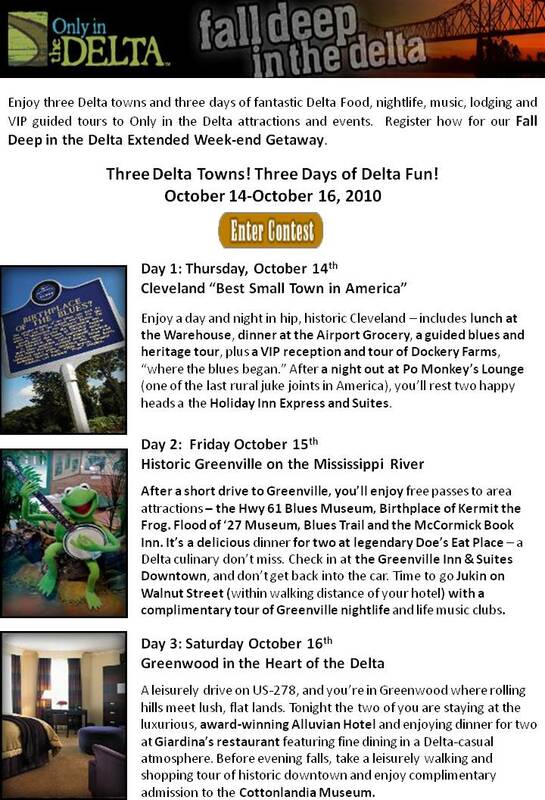 The railroad package includes roundtrip transportation on the Alaska Railroad, an overnight stay in Seward, complimentary shuttle to participating venues, admission to live entertainment and an outdoor BBQ at The Pit. The cost is $249 per person based on double occupancy and guests must be 21 years of age or older. For more information visit www.AlaskaRailroad.com/bluestrain. Tickets are available by calling (907) 265-2494. The Alaska Railroad provides year-round passenger train service for a number of communities across Alaska. With summer and winter service, passenger trains run from Seward to Fairbanks. The 2nd Annual Vermont Blues Festival slated for August 27, 28 and 29 at beautiful Mount Snow Ski Area in Southern Vermont, produced by the Mount Snow Ski Area and the management team of the Pocono Blues Festival, which for 19 years consistently is the biggest blues festival on the East Coast. This year’s lineup features 13 national acts performing over the three day period on two stages headlining Grammy Award winner Johnny Winter, Marcia Ball, Kenny Neal, Trombone Shorty and Orleans Avenue, Joe Louis Walker, Ruthie Foster, Ryan Shaw, Teeny Tucker, Big James Montgomery, Andrew Jr Boy Jones, Alexis P Suter, James Armstrong, Paul Rishell and Annie Raines. The location is four hours from New York City and two and a half hours from Boston, Massachusetts. Last year’s event attracted blues fans from 15 states. There is plenty of free parking, scenic chairlift rides and many southern soul food outlets. Plenty of onsite and nearby lodging and camping. 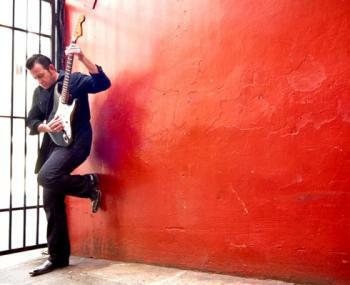 Save up to 30% on advance tickets until August 24 by going to vermontbluesfest.com. The combination of the picturesque setting, national artists that rarely perform in new England and the talented staff that welcome festival goers from 15 states are the main reasons why you should put this event on your calendar. Torontostar.com - When Nicole Christian was in Grade 5 in Rochester, N.Y., her teacher asked the students to write a letter to their hero. Christian chose horror writer Stephen King, whose books she was devouring. Atlanta, Ga. – WRFG’s 25th Annual Labor Day Blues Barbecue – the premier fundraiser for Atlanta’s only community radio station – will be on Monday, September 6, at the Park Tavern, located at 500 10th Street. Michigan based Motor City Josh and the Big 3 will headline the event. This year’s honoree is Georgia bluesman Roy Lee Johnson, who wrote Mr. Moonlight which was covered by the Beatles on their Beatles ’65 album. Also appearing will be Little Brother Jones, the Liz Melendez Band, the Tony Bryant Band and the Breeze Kings. Barbecue will be available throughout the day from Fat Matt’s Rib Shack. Doors open at 12:30 p.m. and the music starts at 1:00 p.m. This family-friendly fundraiser for WRFG/89.3 FM is supported in part by the City of Atlanta Bureau of Cultural Affairs, and funding provided in part by the Fulton County Commission, under the guidance of the Fulton County Arts Council. $15 donation at the door, children 12 and under are free. Advance tickets available now for $12 at www.wrfg.org/. For more information, please call 404-523-3471. 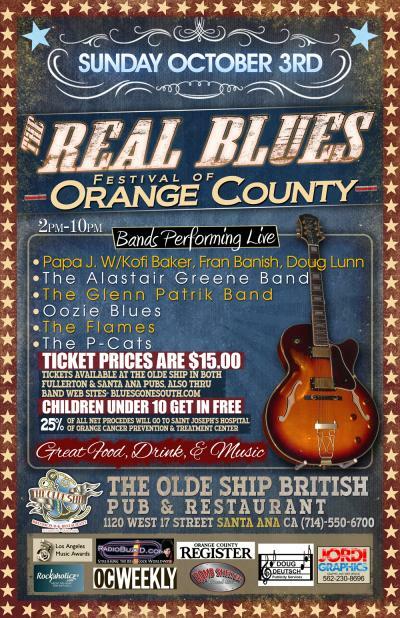 Papa J. W/Kofi Baker, Fran-Banish, Doug Lunn, The Alastair Greene Band, The Glenn Patrik Band, Oozie Blues, The Flames, and The P-Cats. Great Food, Drink and Music. Children under 10 get in Free. 25% of all net proceeds will go to Saint Joseph's Hospital of Orange Cancer Prevention and Treatment Center. Fortune Battle of the Corporate Bands is collaboration between the National Association of Music Merchants (NAMM), Fortune magazine and the Rock and Roll Hall of Fame and Museum. 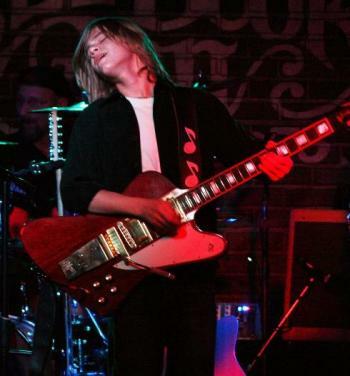 Gibson and Air Products also sponsor the competition, the proceeds of which benefit the Rock and Roll Hall of Fame and Museum's educational programs. "The 10th annual Fortune Battle of the Corporate Bands illustrates how playing music remains a significant part of people's lives," said Joe Lamond, NAMM president and CEO. "While dreams of touring around the country in an old van may have been replaced with work and family responsibilities, these bands are showing everyone how playing music with friends at work is guaranteed fun. And more Fortune 500 companies are finding that what's good for their employees is also good for business." Selected from more than 30 qualified entries, the best 16 bands from across the country were chosen to participate in one of two semi-final regional competitions, and in the end, eight top finalists were selected by a panel of judges to compete for the title of Fortune magazine's best corporate band. "D7" from Allied World Assurance Company – Farmington, Conn.
"D7" is made up of five employees of Allied World Assurance Company. Formed more than four years ago during a company summer outing, the band quickly became a big hit and continues to play company gigs! Pete Dale and the Dealmakers are employees of BTI Systems, a privately funded telecom systems supplier located in Ottawa, Ontario. A one-time gig at last year's corporate sales conference has led this blues-influenced, classic rock band to the finals of the Hall of Fame's 2010 Fortune Battle of the Corporate Bands. "Shale Play" from Chesapeake Energy – Oklahoma City, Okla.
An Oklahoma City-based band, Shaleplay is an eclectic mix of pop and rock. Made up of 100% Chesapeake Energy employees, their music features powerful vocals with confidently executed instrumentation. "DaVita Blues All Stars" from DaVita – Brentwood, Tenn. The DaVita Blues All Stars comprises 11 DaVita employees (called "teammates" at DaVita) representing work functions across all parts of the company (collectively called the DaVita "Village"). Formed in 2000, the All Stars have been dedicated to entertaining the DaVita Village with a blend of funk, country and rock and roll. What do you get when you put music and corporate America side by side? Clash of the Titans? Maybe. Passion? Definitely. Yin meets yang? Possibly. At Deloitte Consulting, an eclectic mix of exceptionally talented professionals from the Northeast puts their own unique stamp on the concept of a corporate band. Not exactly the Beatles, and not yet old enough to be a Rolling Stones, they call themselves Unrestricted Entity. Made up of four lawyers from Hinshaw & Culbertson, "The Nuisance" is a modern rock band that plays a blend of original music and cover tunes. In 2009, the Nuisance recorded its first demo, which includes two original songs - Away in My Mind and Politician. Title14 was formed in 2003 to participate in a band competition within the GE Aviation Engineering Division. From that performance, the idea was formed to reach out to those in the community who could use a little fun and excitement. The 12 member band plays a wide range of instruments including; guitars, keyboards, percussion, and a large brass section. The varied musical interests of the individual members influence the band song selection which ranges from rock to jazz, blues to heavy metal. iTelligence SAP Application Consultant, Brian Widrig, formed "Underpaid" in the winter of 2007. The 5-member band plays at company gatherings, as well as various gigs in Ohio. The band's main interest is to just play music, and as they don't want to be paid, they selected the name Underpaid. The National Association of Music Merchants, commonly called NAMM in reference to the organization's popular NAMM trade shows, is the not-for-profit association that unifies, leads and strengthens the $17 billion global musical instruments and products industry. NAMM's activities and programs are designed to promote music making to people of all ages. NAMM is comprised of more than 9,000 Member companies. For more information about NAMM, interested parties can visit www.namm.org/ or call 800-767-NAMM (6266). Noisecreep.com - Ozzy Osbourne may be the prince of the heavy metal fiefdom, but the legendary singer recently told the folks at VH1 that he would like to flex his creative muscles and perhaps record something that's not metal. While that may seem shocking, since his name is practically synonymous with metal, it might do the former Black Sabbath frontman some good to try something new. 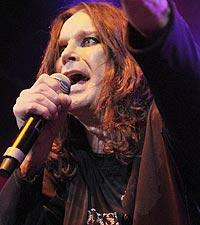 "Being Ozzy Osbourne is great, I mean it's been wonderful being the singer of Black Sabbath, having all those hits through Sabbath and then on my solo career is one thing," Osbourne admitted, "But then if I want to do anything branching away from the heavy stuff, people will go, 'Oh, he's sold out. Oh, he's not doing it. Oh, he's singing a love song. Oh, he's singing about the ...' or whatever." Osbourne also said he'd like to form a fake band in order to be able to expand his creative horizons. He commented, "I would like to form a fictitious band just to make a different record but it's the time it would take. I mean, it takes me all my time just to do an Ozzy record. But I would dearly like to get a mini-supergroup together. Nothing like heavy rock, like a bluesy vibe." Ozzy Osbourne does the blues? I can just hear it now. While these may be wistful Ozzy daydreams, metal fans shouldn't get their knickers in a knot over this news, as he'll be touring in support of 'Scream' for the next year, starting with this month's rebooted Ozzfest. IT HAS played host to Cerys Matthews and the cream of British folk and blues music but a major cultural landmark could be lost forever. The De Valence Pavilion, in the seaside town of Tenby has been put on the market a month after the trust set up to run it went into liquidation. There are fears the next owners or leaseholders could apply for change of use, ending the long tradition of entertainment at the pavilion. Tenby Town Council, which owns the building, last night said no decision has yet been made to sell or redevelop the building. The pavilion was taken back under public control by the town council, which said the facility was in a “financial black hole”. Tenders of interest are now being invited to take over the pavilion, either on a leasehold or freehold basis. Applicants should submit outline proposals to run the facility, which includes offices, a cafe, the dance and function hall, and a meeting room and bar, currently used as the mayor’s parlour. The deadline is September 24. The submissions will be considered by Tenby Town Council and a shortlist of applicants drawn up. Property agents Birt and Co said the pavilion could be put to a number of uses. “The De Valence is a well located facility within the town walls and could be put to a number of uses, either to continue as an events venue, an attraction such as a museum or exhibition hall, or other ideas to be put forward as part of the initial submission,” a spokesman said. Tenby mayor Julie Evans said the council was exploring all options for the future use of the building. Following the pavilion’s closure last month, this year’s Tenby Arts Festival and Tenby Blues Festival had to find alternative accommodation. Blues festival organiser Chris Osborne said the pavilion was a key venue in West Wales and has played an important role in establishing Tenby as a cultural destination. 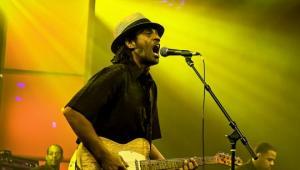 Artists who have played at the event include The Animals, Eddie Martin, Ian Sergal, The Revelators and Nine Below Zero. 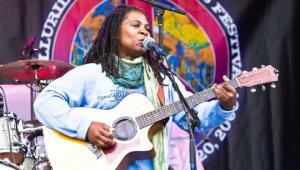 Tenby Blues Festival, set up four years ago, is a fixture on the UK blues calendar. It had booked the pavilion for the November event. “Without the pavilion, or an alternative venue with a similar capacity we cannot secure bookings for big name acts,” Mr Osborne said. “The council has said it wants to retain the pavilion as a community asset but I can’t believe that it is discussing selling it in the same breath. “Unfortunately it could be a case of money will do the talking here but we feel that it is absolutely crucial that Tenby has this kind of facility, and if not this one then another like it. “Unfortunately as event organisers we are left in a catch-22 situation where we cannot now expand events like the blues festival. Join Us August 27 – 29, 2010! 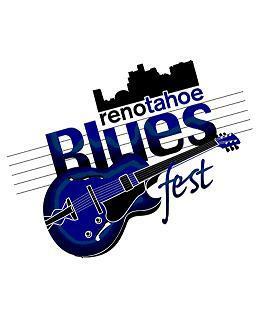 The 2010 Reno-Tahoe Blues Fest is scheduled for Aug. 27 – 29, 2010 at Robert Z. Hawkins Amphitheater in Bartley Ranch Regional Park in Reno, Nev.
We’re celebrating our 6th year as the Reno-Tahoe Blues Fest with three eveings of all the blues you can handle. Annually, the Reno-Tahoe Blues Fest celebrates the history, culture and spirit of the blues with a multi-day festival attracting audiences from around the country to hear some of the biggest names in blues. The event’s mission is to support music education for youth in the Reno-Tahoe area through a scholarship program and ongoing assistance for school music equipment purchases and jazz band programs. Join thousands of Sarasota music fans as they gather at Ed Smith Stadium Complex , November 6th for the 20th Annual Sarasota Blues Fest. Bring your Blankets & Lawn Chairs for Festival Seating. 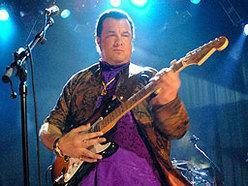 WENN.COM - Action man Steven Seagal has lashed out at critics of his music, insisting blues greats like B.B. 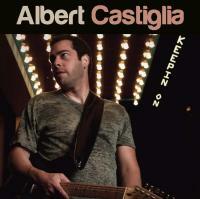 King and Albert Collins have given him reason to believe he's good at what he does. The Under Siege star has been ridiculed for playing the blues but he's not planning to put down his guitar anytime soon - especially after earning praise from his musical heroes. Seagal tells Hustler magazine, "I've played with the greatest blues masters and legends of our time. They love, respect and praise me. That should mean f**king something. "I've shared the stage with Albert Collins, Clarence 'Gatemouth' Brown and B.B. King and they say I belong there... I really don't give a f**k (about the critics)." PEACHES STATEN "Live At Legends". Swississippi Records represents a hybrid name, adventurous concept and intense advocacy for a classic sound. CEO Chris Harper and General Manager Dave Katzman see their company as a bold 21st century venture designed to utilize state-of-the-art technology and business acumen on behalf of the blues, a music whose roots and lyrical vision continues to inspire fans and performers around the world. (CEO Harper performs/records under the moniker "Swississippi" Chris Harper). You may not know the Mississippi Sheiks, but blues musicians sure do. These 1930’s blues pioneers gave us “Sittin’ On Top of the World,” “Things About Comin’ My Way,” and many more American standards. 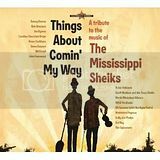 Guest Steve Dawson is producer of and player on THINGS ABOUT COMIN’ MY WAY, a new CD, and live-performance DVD-- a tribute to the Sheiks, with John Hammond, Geoff Muldaur, Madeleine Peyroux, John Hammond, the North Mississippi All Stars, and more. They will be played. Plus, the Sheiks done up by Howlin’ Wolf, Cream, and Jack White. 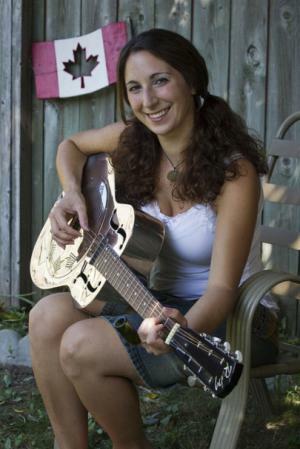 Also: new music from Toronto blues diva, Shakura S'Aida. 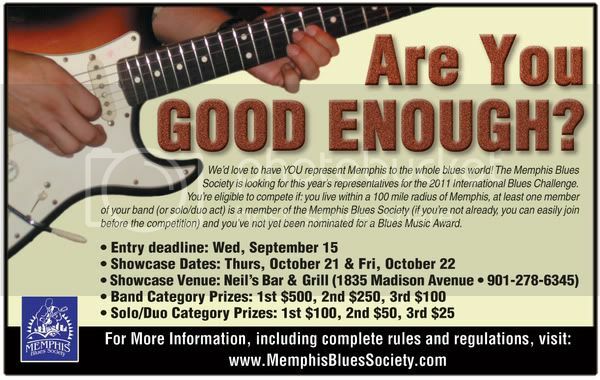 And a shot for you to win one of three Labor Day prize packages for free admission to a Blues Festival. You can also register on our contest page to win cool blues t-shirts from a brand new website, bluescentric dot com. Kitty Hawk, North Carolina, U.S.
St. Louis, Missouri , U.S.